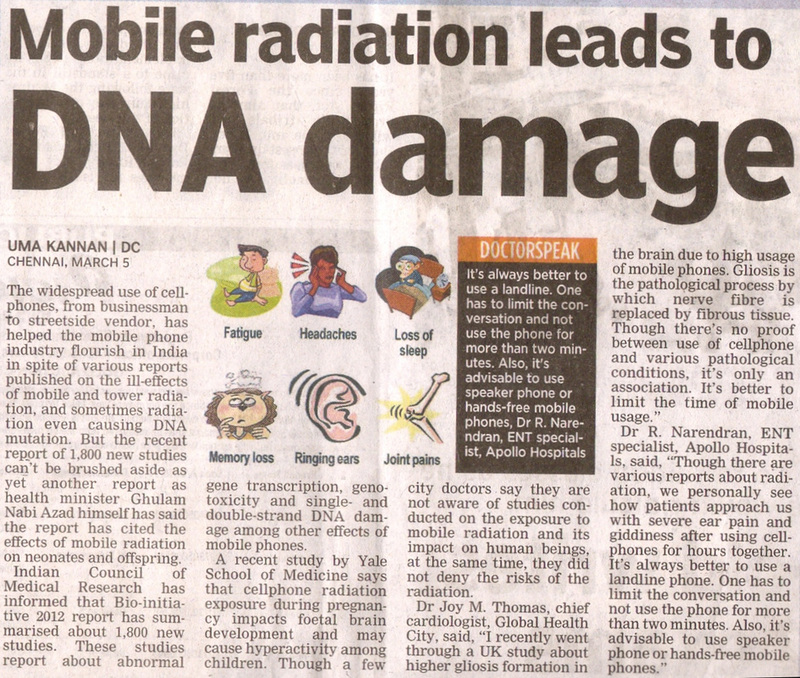 Chennai: The widespread use of cellphones, from businessman to streetside vendor, has helped the mobile phone industry flourish in India in spite of various reports published on the ill-effects of mobile and tower radiation, and sometimes radiation even causing DNA mutation. 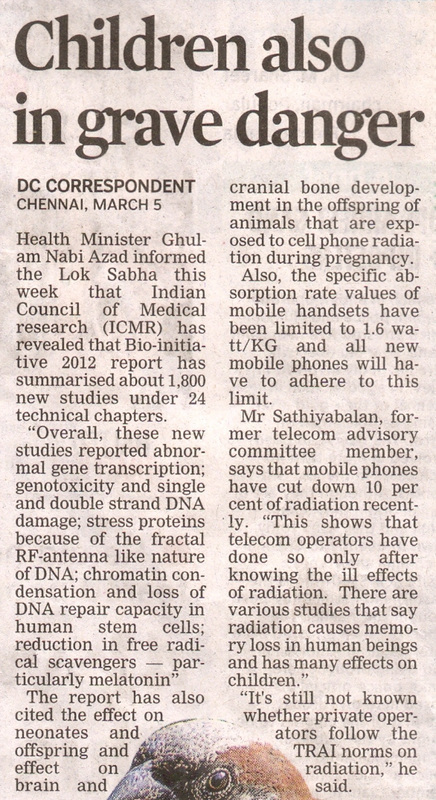 But the recent report of 1,800 new studies can’t be brushed aside as yet another report as health minister Ghulam Nabi Azad himself has said the report has cited the effects of mobile radiation on neonates and offspring. Indian Council of Medical Research has informed that Bio-initiative 2012 report has summarised about 1,800 new studies. These studies report about abnormal gene transcription, genotoxicity and single- and double-strand DNA damage among other effects of mobile phones. A recent study by Yale School of Medicine says that cellphone radiation exposure during pregnancy impacts foetal brain development and may cause hyperactivity among children. Though a few city doctors say they are not aware of studies conducted on the exposure to mobile radiation and its impact on human beings, at the same time, they did not deny the risks of the radiation. Several years ago a friend was surprised to see sparrows nesting in my home. It was our practive never to switch on the ceiling fan or loosen the curtains behind which they nested, to make sure they were not disturbed. The two pairs of sparrows raised four young ones. Thrusting a few grains into the open mouths of their young, the adult sparrows would flutter around protectively while they grew stronger by the day. Our joy of watching them was, however, shortlived as one by one they began to fly away with the lush paddy fields around our house vanishing, leaving us with a post office, a school and several apartments. Just as we had given up hope of ever seeing the sparrows again, they have started making a sudden appearance of late in the backyards of houses with gardens, although they don't linger for long. Still, it's a reason for hope that all may not be lost where the sparrows are concerned although it's the same story almost everywhere in the suburbs of Chennai, which have seen their numbers dwindle drastically as more and more open spaces have given way to a concrete jungle. Best of all, everyone can contribute to bringing them back . If you want to save the sparrows place some grains of cooked rice on the porticos or the roofs of your houses or raise a garden in your backyards, as this will attract them. You may initially invite squirrels, crows or even ants, but eventually the sparrows will arrive as they are naturally drawn to human habitats. The effort would then have been worth it. Health Minister Ghul­am Nabi Azad informed the Lok Sabha this week that Indian Council of Medical research (IC­MR) has revealed that Bio-initiative 2012 repo­rt has summarised abo­ut 1,800 new studies un­der 24 technical chapters.“Overall, these new studies reported abnormal gene transcription; genotoxicity and single and double strand DNA damage; stress proteins because of the fractal RF-antenna like nature of DNA; chromatin condensation and loss of DNA repair capacity in human stem cells; reduction in free radical scavengers — particularly melatonin”The report has also cited the effect on neonates and offspring and effect on brain and cranial bone development in the offspring of animals that are exp­osed to cell phone radiation during pregnancy.Also, the specific ab­sorption rate values of mobile handsets ha­ve been limited to 1.6 wa­tt/KG and all new mobile phones will ha­ve to adhere to this limit. “It's still not known whether private operators follow the TRAI norms on radiation,” he said.